There are 50 restaurants in The Dells.They close early, so while you're still on the road all members of your group need to decide what category they want. Since we usually arrive at mid evening, we stop by our motel and one adult goes in and verifies that we've arrived and there are no problems with the reservation, then we head for the restaurant. You can pick from fast food, steak house, Mexican, Caribbean, German, Italian, Indian, Chinese, Polish, and Jamaican.. There is a classic diner, several buffets, a Cheese Factory, and several places combining dinners with stage shows. 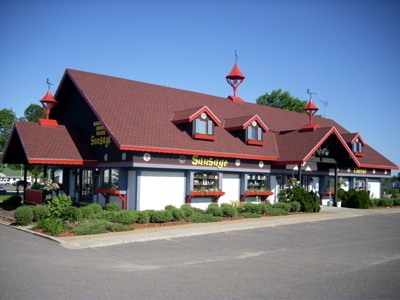 Don't worry about prices as none of the Dells eateries are expensive. However, prepare yourself for some interesting decor. The Dells is a great mood setter for a trip to the Boundary Waters, Glacier, Yellowstone, the Black Hills or Apostle Islands. 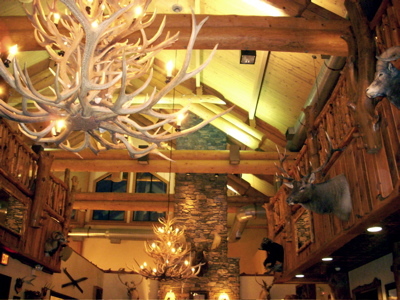 It features quite a few restaurants heavy with polished log interiors, rough hewn furniture, antlers, snowshoes, canoes, paddles, skiis and trophy heads. The circus of water parks, roller coasters, and neon lights that has grown up around The Dells misleads people into forgetting the real heritage of the place : hunters, fishermen, loggers, Native Americans, pioneers, explorers, and trappers. This decor is very much in keeping with local history. 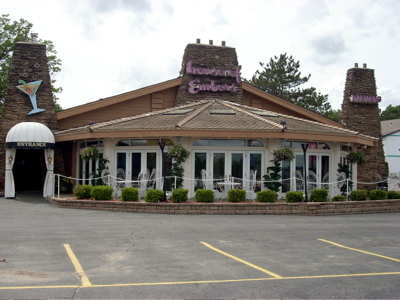 The House of Embers is the best restaurant in The Dells, the best between Chicago and Minneapolis, and probably the best in Wisconsin. Wally Obois opened it in 1959 as a barbeque pit. He still works there, but officially retired and sold out to his sons Mark and Mike in '98. They graduated from NY's Culinary Institute of America. Father and sons have been perfecting their barbeque process for 49 years. They dry rub it, slow fire it over hickory logs in their own smokehouse, braise the ribs in their own marinade and then apply their own barbeque sauce. You can order the ribs as an entree in a half or full rack, or as an appetizer as a third rack. If you have the slightest appreciation of good barbeque, you should try at least the appetizer, because this is some of the best you'll ever taste. But The House of Embers has expanded far beyond just a barbeque pit. Tossed and Spinach Salads are outstanding. Their steaks, veal and seafood are all wonderful. Their Crab Cakes rival those at the best coastal restaurants. They mix crabmeat, scallops and shrimp, saute the cake, then top it with a lemon garlic mustard mayonaisse that sets up a tension between its tartness and the cake's sweetness. We know people who come here just for the Cinnamon Rolls, homemade by Wally's wife Barbara since 1960. Save room for the White Chocolate Cheesecake. 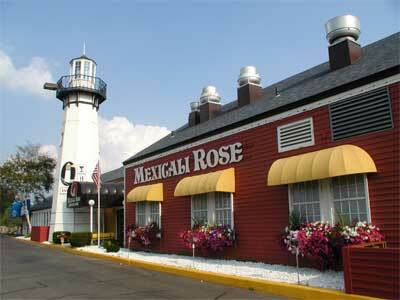 The second best restaurant in town is Mexicali Rose, right at the bridge on Broadway. The boat docks are directly below, so you could eat on the deck and look out over the scenic river valley. Make no mistake, however : This is one of the nation's great Mexican restaurants. You have the usual Mexican favorites, but Mexicali Rose is especially good at several specialties. Its seafood entrees are great. Try the Seafood Enchiladas, the Huachinango Veracruzana (Red Snapper sauteed in Onion, Green Pepper and Tomato Salsa), the Grilled Swordfish with Pineapple Salsa, but most especially try the Stuffed Flounder a Lemona. Mexicali Rose stuffs its Cheese Enchiladas with fresh Wisconsin cheeses and it makes a huge difference. They offer Enchiladas Espinaca, enchiladas stuffed with spinach and fresh Wisconsin cheeses in bechamel sauce. Those same Wisconsin cheeses also raise their Chili Rellenos to a whole new level. 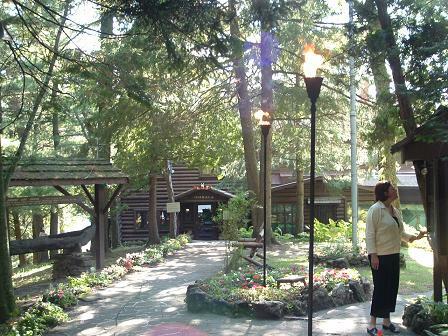 If you only spend two nights at The Dells, this is the second dinner restaurant you should visit. And if you're bringing a group the prices are quite affordable. You can walk here from the Indian Trail Motel, Rome, or KOA Campground. Corner of Highways 12 and 13. No trip to The Dells is complete without a meal at The Moosejaw. They claim to be a Pizza Parlor and Microbrewery, but they're much more than that. The Beer & Cheese Soup contains onions, bratwurst, potatoes, and red and green peppers. Chicken Noodle Soup adds carrots, onions, diced chicken, and fresh herbs. Either soup is a meal in itself. Among their entrees, we like the Walleye (in lemon buerre blanc), Iowa Chops (in a Caribbean sauce), and Beer Ribs (they use a beer glaze). Their Beer Bread is unique, as is their Mile High Cheesecake. The adults in our group rave about their Apricot Ale, Raspberry Cream Ale, Weissbier (wheat ale, served with a lemon), and Wisconsin Honey Ale. We're not much into ales, but we sure love their handbrewed Root Beer. We never have room, but we'd love to take a case of it home with us. This is a great restaurant for youth groups or families. 110 Wisconsin Dells Parkway out past the left turn. 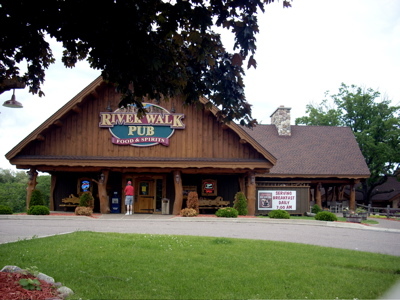 The Riverwalk Pub is right behind the boat dock ticket office, at the entrance to the River Walk, a several blocks long sidewalk running along the water. There's a patio out back looking down on the river, so you can eat and watch the boats coming and going from the docks. The Riverwalk works best either just before or just after a river cruise. You could stop for breakfast before your cruise departs. They serve hearty breakfasts with names like The Lumberjack Special, Northwoods Skillet, Riverwalk Skillet and South of the Border Special. The lunch menu begins with a great soup of the day, several good salads, and the Beer Batter Cheese Curds, but its strength is its sandwiches and burgers. The Elkburger is the star, but the Italian Beef and the Bomber (hot salami, pepperoni, green pepper, onion, mozarella cheese, on a Hoagie bun with creamy Italian dressing) are also favorites. The dinner menu lists mostly fried entrees, but there are steaks, pizzas, and wall eye. Markest Square Cheese Shop is not a restaurant, but we always stop there on the way out of the Dells to stock up on fresh cheese to munch on as we cruise the interstate. They can also pack the cheese to keep if you want to take some home to Mom. This is fresh Wisconsin cheese produced just down the road at local cheeseries. You can choose from a dozen flavors and styles. We like curds and wedges because they're easy to munch on, but the wheels are nice to take home to Mom. 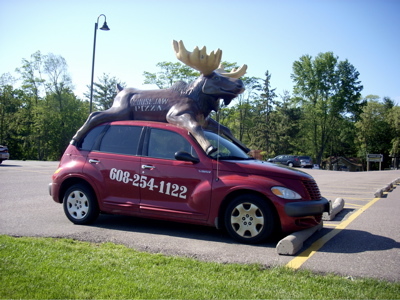 To find Market Square, just stay on the Wisconsin Dells Parkway (highway 12) all the way South to the interstate. Just before the interstate, look to the right, right past Denny's Diner. Just one caution : Don't eat a whole bag of cheese in one morning or one afternoon. We've had a few people try that, and their stomachs weren't too happy with them for a day or so. 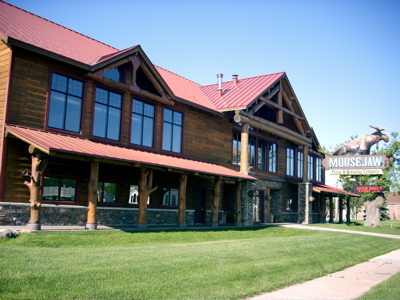 The Copper Oak is located South of town at the Ho Chunk Casino. 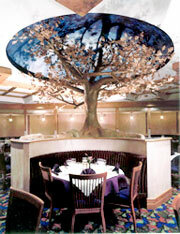 It is named after a huge oak tree made of copper which spreads it arms in the middle of the restaurant. The casino location is an advantage because all casinos keep their food prices down and their quality and portions up to help attract customers. Copper Oak is a classic steak house which also offers a fish of the day. Their specialty is steak grilled over Wisconsin hickory, but they can also grille it over Texas mesquite. Ho Chunk is run by a local Native American tribe. Lately, reviews have been critical of the casino and the hotel, mentioning worn carpet and lackluster service, but even the most negative critics continue to praise the restaurant. Next door is the Stand Rock Buffet, which is very ample, offers several Native American dishes, and is a great way to feed a youth group. Marley's promotes itself as "A Taste Of The Caribbean." That's pretty accurate. The menu is not extensive but does include some excellent items, beginning with the Loaded Baked Potato Soup. This plus a salad could be a meal unto itself. Several people in our group over the last few years have declared the Jammin Fries here the best fries they've ever tasted. The Caribbean Quesadillas are unique. "Jerking" meat is a Caribbean tradition, and Marley's offers jerked chicken, pork, and grouper. Marley's House Specialty is The Big Kahuna, a platter of all three plus rice and vegetables. The sandwich page offers several worth ordering, led by the Gator Burger, which really does contain fried alligator (it resembles chicken but has more flavor). The usual island rum and sugar cane drinks are featured, and decor is Contemporary Jamaica, meaning palm trees, parrots, floral shirts, and bongo drums. 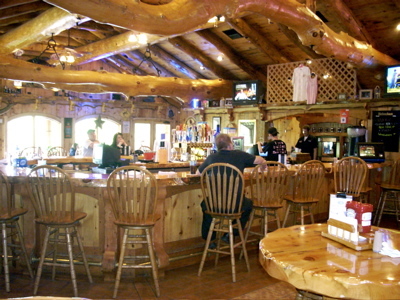 Marley's sees itself as the laid back party center for The Dells, so if you show up on a Friday or Saturday night you may find a live band blaring Harry Bellafonte music ("Down in Kingston Town") and dancing loosely resembling the Bahama Shuffle. 1470 Wisconsin Dells Parkway. 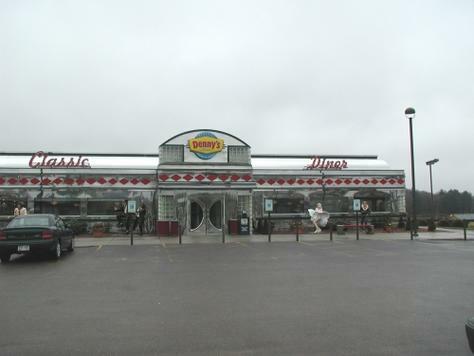 Denny's Diner is two miles South of town toward the southernmost interstate exit. If you don't get to eat in a diner very often and want to see what that was like, it's worth a stop. But we'd recommend it more for lunch than dinner. The menu is very ordinary. We've eaten in several diners that were really good, but this is a just a basic Denny's menu cleverly repackaged in nostalgia. It is, however, a pretty good replica of a 1950s diner. There are vinyl covered counter stools, shiny booths and black and white checkered floors and walls. The stainless steel curved outside walls are a great representation of original diners in places like Somerset, Pa. The charm here is definitely in the decor. They're at their best with breakfasts, but the milkshakes, burgers and pies are pretty good later in the day. 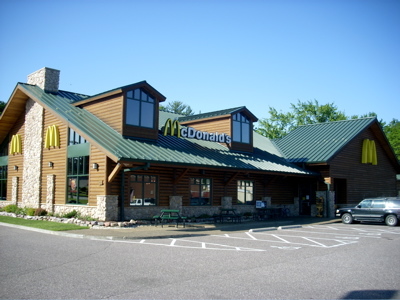 We're not big advocates of fast food restaurants, but anybody visiting the Dells has to stop at McDonalds. You're not going to see a McDonalds like this any-where else: not the Adirondacks, not Montana, not even Alaska. 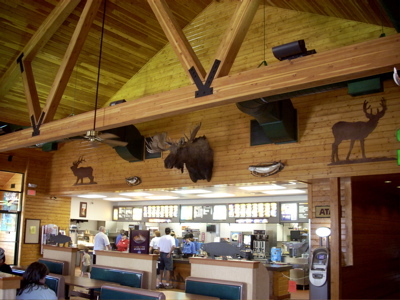 It's done in Northwoods architecture, and features Moose Burgers, Antelope Wraps and Wisconsin Cheese. Forget carry out. You need to eat inside here, and bring your cameras.